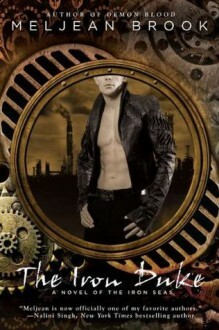 View our feature on Meljean Brook’s The Iron Duke. First in an all-new series where seductive danger and steampunk adventure abound in the gritty world of the Iron Seas. After the Iron Duke freed England from Horde control, he instantly became a national hero. Now Rhys Trahaearn has built a merchant empire on the power-and fear-of his name. And when a dead body is dropped from an airship onto his doorstep, bringing Detective Inspector Mina Wentworth into his dangerous world, he intends to make her his next possession. But when Mina uncovers the victim's identity, she stumbles upon a conspiracy that threatens the lives of everyone in England. To save them, Mina and Rhys must race across zombie-infested wastelands and treacherous oceans-and Mina discovers the danger is not only to her countrymen, as she finds herself tempted to give up everything to the Iron Duke.